I was sitting in my favorite park the other day enjoying a view of the ocean, practicing my usual and undistracted form of presence when I looked toward a stand of birch trees and saw a gaggle of teenagers—assuming the ‘Pokemon Go’ position. You know the one, mobile device held in a death grip. Screen positioned at an uncomfortably close distance to the face at chest height. Eyes downcast and head slumping. Fixated on the world delivered through that phone. Were they in a house of worship, their countenance would convey great reverence, the kind one might reserve for such activities. Back in the day I guess. On this day though in this age, we bow not to gods but to apps. And unless you have been living under a rock, a game long ago relegated to the scrap heap of history is making a big comeback—as a mobile application. As my youngest explained to me the first time it was popular too many years ago to count, “everyone plays Pokemon, Daaaad.” The implication being, I was just too “vintage” to really understand and that dad has more than one syllable. Pokemon has never truly gone away, perhaps only existed the media lime light, but now is back in full force with more players than ever with its “Go” version for mobile. This time though, it is not being played in dimly lit suburban basements where out of sight is out of mind. Players are everywhere there is a wireless signal—from the sidewalks and streets of our cities to the parks and paths of more bucolic settings. In networks across the globe, Pokemon Go traffic has quickly come to prominence. One campus network manager remarked to us, “there has been nothing quite like this since Netflix streaming went live several years ago. There was no Pokemon traffic at all, and then boom, it’s everywhere – it’s ubiquitous.” We know, other customers have told us a similar story. Being in the network visibility business, we view this as a positive. We have always said, you cannot control what you cannot see. Or, for that matter, even know that control might be required. So, the ability to easily and quickly implement new application signatures has never been more important. Which is why we welcome this newcomer, like those that came before it, to step into the light of day. Since it only further proves the value of our dynamic signature updates—a foundational part of all our solutions. The aforementioned network manager, sets a simple policy up through Applications Objects that identifies Pokemon Go traffic. This is then tied to a prescribed level between his redundant core Exindas and the Internet. 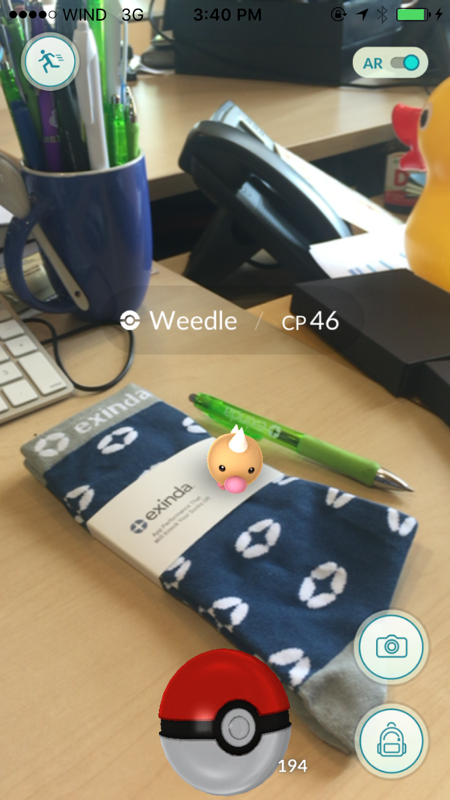 “We are a beta test site for Exinda releases and as such we had access to both the latest ExOS Release, which supports dynamic signature upgrades and the Pokemon Go signature, which was just recently released,” said the customer. As with all operations, recognition of a new traffic only requires a few simple clicks to configure a network wide policy. “The simplicity of Exinda operation and signature implementation allows us to respond quickly to changing conditions in the network. This “Pokemon craze” caught us by surprise initially, but we were able to quickly respond and implement policy that protects our network from abuse and allows all our users the freedom to use the network in a fair way,” said this early adopter. When networks need to evolve quickly to new, emerging traffic types and policy is required to control the associated communications of the “next big thing” Exinda stands ready with a steady stream of new application signatures.